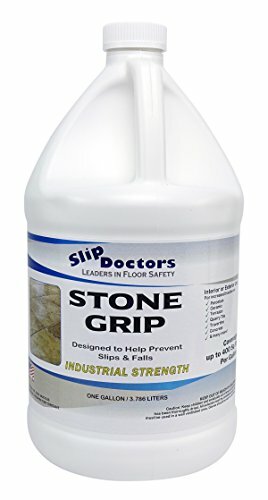 SlipDoctors stone-grip will dramatically increase traction and improve safety on wet and dry stone floors. The slip resistance will surpass guidelines recommended by ADA/OSHA for floor safety. It is easy to use. To treat, first clean and dry the flooring. Next, apply the treatment and rinse off. A long-lasting answer to the problem of slippery wet floors. It features a water based treatment, increases the co-efficient of friction, easy application and low odor, little or no appearance change, one application can last over two years, can be used indoors or outdoors. Immediate usage after application. One gallon will treat between up to 400 square feet. Application temperature: above freezing. Evaporation can occur at higher temperatures.. It is biodegradable. 5 Years shelf life. 2-5 Years treatment life. Application: surface must be free from wax, sealant and grease. Dilution is not necessary. Apply using mop or hand sprayer. Neutralizer: fresh water with 2-3 table spoons of baking soda. Exposure time: 5-20 minutes. Initial testing suggested.. Clean up: fresh water and ph neutral floor cleaner. Ongoing maintenance: no change in procedures necessary. Slip resistance: Exceeds American Society of Testing Materials (ASTM) and Underwriters Laboratory (UL) of 0.50 COF. Typical applications hotels, motels, resorts, hospitals, nursing homes, assisted living, restaurants, factories, apartments, health clubs, shopping malls, office buildings, swimming pool decks, bathroom floors, showers and staircases. If you have any questions about this product by SlipDoctors, contact us by completing and submitting the form below. If you are looking for a specif part number, please include it with your message.